Transform yourself into a cartoon mouse with this Missy Mouse Fancy Dress Costume, inspired by the iconic look of Minnie Mouse. Included is a red dress decorated with white polka dots, black and white trim to the hemline and an attached black belt. 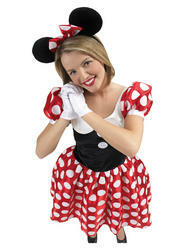 Completing the Missy Mouse Costume is a black headband styled with a red and white bow and a pair of black mouse ears. A cute and stylish costume great for wearing to a cartoon themed fancy dress party. Headband with bow and mouse ears.